Ignite scientific-enquiry, teach critical thinking, problem solving, collaboration and independent learning through a vibrant and stimulating approach to primary science. Written by a highly experienced team of authors with a shared philosophy of learning grounded in world-leading science education research and global, leading methodologies. 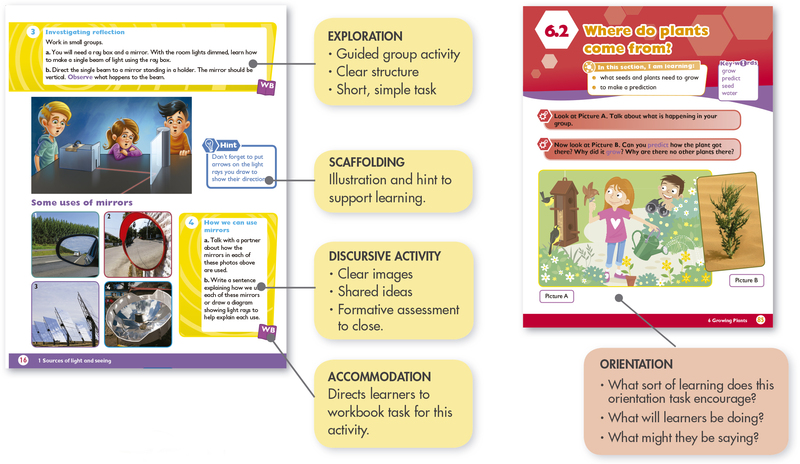 100% match to the Cambridge Primary Science Curriculum Framework (stages 1 – 6). Integrates and clearly identifies the skills of scientific enquiry and critical thinking. All materials are international in content, flexible and adaptable for all global regions. There is English language support across all the resources to support teachers and learners whose first language may not be English. full teacher support including professional development. In line with the requirements for the Cambridge Primary Science curriculum framework. Each topic is introduced through engaging activities designed to stimulate creative scientific thinking. Whole class teaching is focused on firmly embedding the concepts through active individual, pair and group activities and carefully scaffolded learning. Units end with checklists and consolidation sections to ensure learners understand the key concepts. Learners are able to express and record the development of their scientific thinking through carefully thought out games, quizzes questions and activities. Pages are clearly cross-referenced with the corresponding stage in the Student Books. Engaging practical activities that not only back up the scientific concepts introduced in the classroom but also show how science is all around us all the time. Guidance on assessment and di­fferentiation. A section on potential scientific language challenges students may face in each topic. Full answers to all activities are also provided. Teacher’s notes and full answers for all activities.